Thyroid hormone – an iodinated molecule synthesized and secreted by the thyroid gland – is distributed throughout the body to control embryonic development and other important process such as growth, metabolism, cardiovascular and muscle-skeleton systems, and cognitive function. Two forms of thyroid hormone exist, i.e. the precursor thyroxine or T4, which contains four atoms of iodine, and triiodothyronine or T3, the active hormone that triggers biological effects. 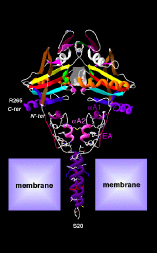 Most T3 is produced via the action of the deiodinases, dimeric integral membrane selenoproteins composed of a single N-terminal trans-membrane segment connected to a larger globular domain that contains the active center embedded in a thioredoxin fold. A striking feature of this pocket is the presence of the rare amino acid Selenocysteine that is critical for deiodination. 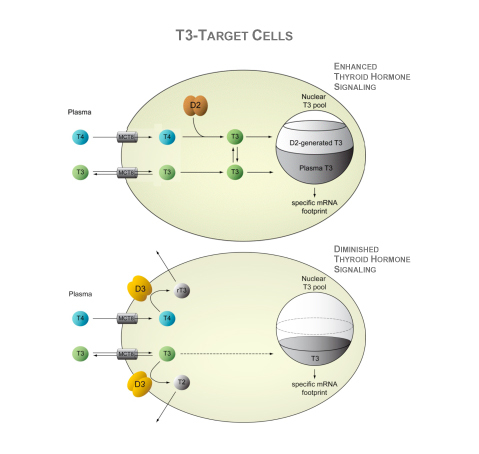 T3 enters the target cells through specific thyroid hormone transporters and, once inside the cells, gains access to the cell nucleus where it interacts with nuclear receptors (TR). The T3-TR complex controls the expression of specific sets of T3-responsive genes, thus promoting T3-dependent biological effects. Deiodinases modify thyroid hormone signaling on a cell-specific fashion. The type II deiodinases, D2, activates T4 to T3 within the endoplasmic reticulum, and thus increases the supply of T3 to the cell nucleus and amplifies thyroid hormone action. T3 molecules eventually leave the cells and slowly equilibrate with the pool of T3 in the circulation. In healthy adult individuals, about 80–90% of the circulating T3 is produced by deiodination of T4, most of it via the D2 pathway; only 10-20% is directly secreted by the thyroid gland. In contrast, D3 inactivates thyroid hormone and dampens thyroid hormone signaling in target cells. The D3 pathway also explains most of the T3 clearance from the circulation. D3 is normally present in the plasma membrane but, under hypoxic and/or ischemic conditions, it is redirected to the nuclear envelope where it inactivates T3. In addition, during illness, D3 expression is enhanced severalfold or ectopically activated in most tissues, including liver, skeletal muscle and heart, which is generally accepted as an adaptive process. The negative feedback loop between circulating thyroid hormone and the neuroendocrine system (hypothalamus and pituitary gland) is the fundamental mechanism preserving thyroid hormone homeostasis. A reduction in plasma T4 or T3 rapidly activates secretion of hypothalamic thyrotropin-releasing hormone (TRH) and pituitary thyroid-stimulating hormone (TSH), which stimulates the thyroid to secrete T4 and T3 and normalize plasma levels of these hormones. Given that TSH and TRH genes are negatively regulated by T3 (and not T4), it is crucial that T4 be converted to T3 in order to activate the negative feedback mechanism. This is mediated by D2, a critical step in this mechanism. D2 is co-expressed with TSH in pituitary cells and is also expressed in tanycytes, specialized ependymal cells lining the floor and infralateral wall of the third ventricle. In fact, tanycytes and TRH-expressing neurons in the paraventricular nucleus (PVN) are intermingled in the external zone of the median eminence, providing the physical proximity for D2-mediated feedback signaling. A striking feature of D2 is its inactivation by catalysis of T4 to T3 via ubiquitination, i.e. 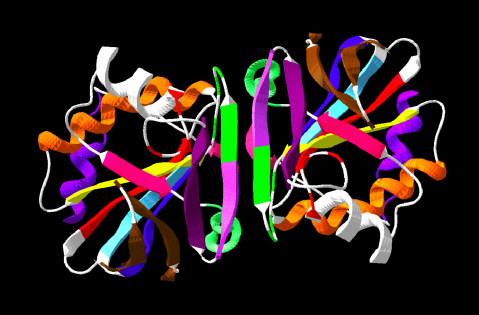 the covalent attachment of mono- or polyubiquitin chains, a critical step by which the function and fate of many proteins can be altered. It is assumed that interaction of T4 with the catalytic center of D2 or the deiodination reaction itself promotes conformational changes in D2 as to expose two critical Lysine residues that can then be conjugated to ubiquitin. 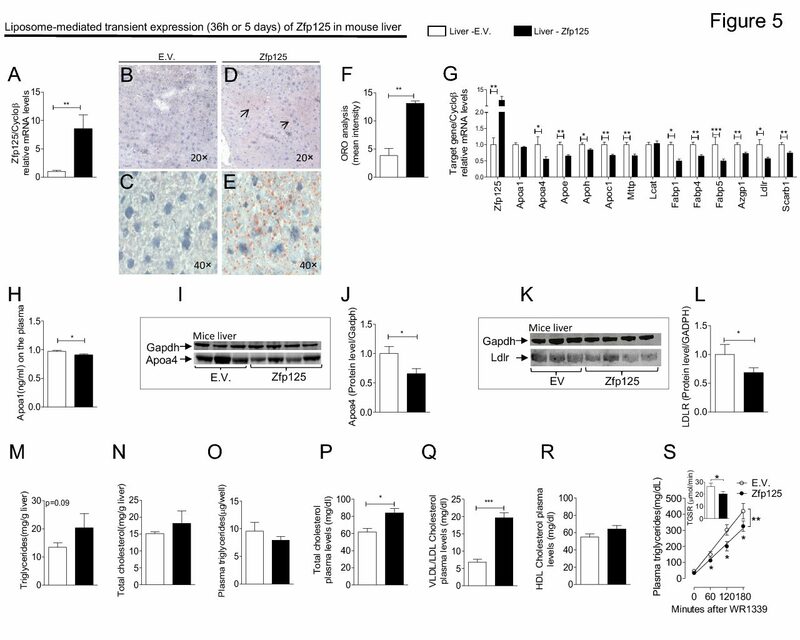 D2 conjugation to ubiquitin (Ub-D2) is catalyzed by proteins involved in ER-associated degradation (ERAD) and by developmental proteins downstream of the Hedgehog signaling pathway. Remarkably, inactive Ub-D2 can be reactivated by the deubiquitinating enzymes – USP33 and USP20 – and rescued from terminal proteasomal degradation.